Do you bounce out of bed before the alarm every morning, with a spring in your step and a smile on your face? Or do you hit the snooze button seven times in a row before eventually dragging your body out from under the duvet to face the world? How you get up in the morning is largely dependent on how you feel about your day ahead, don’t you think? I’m one of those really annoying morning people, who wake up bouncy before 6am with no alarm, in a genuinely good mood. This is mainly because I love my job, and look forward to every day. Not everyone feels the same way. If you dread Monday mornings, and find yourself clock-watching during the day, it could be that you’re in the wrong job, or that you’re in the wrong mindset. The former is harder to fix, other than job-hunting for something that suits you better. The latter may be solved with some thinking about what it is that you actually do for a living. You may be a negotiator. It may list on your job description, tasks like ‘viewings’, ‘negotiating offers’, and ‘sales progression.’ True, these are all part of the job of a negotiator, but what’s your role as your client sees it? How about ‘fixer’, ‘adviser’ and ‘trouble-shooter’? These are the reasons a client will use your agency, and not an online agent, after all. When a vendor decides to sell their property, they embark on a roller coaster of emotions that may take them to the very heights of excitement and pleasure, and the very depths of despondency and despair – and everything in between. They may experience elation at the first optimistic valuation, followed by disappointment at the lack of interest; hope and anticipation at each viewing, then frustration when the negative feedback rolls in. And so on it goes, until finally, after months or even years, they get to the key handover day, feeling like their emotions have been put through a washing machine. You are there for them when they need it most. Your job is to reassure, to keep them motivated and focused on their sale, to give them peace of mind that the journey to their dream home is safe in your hands. To give them hope when no one is interested in even viewing their home, and empathise with them when the survey downvalues by 10%, or worse. I can understand why negotiators sometimes find it hard to look forward to their working day, with all the task-based jobs they have in front of them. But a coach has a very important role; one to feel good about; one worth getting out of bed for. Ask your current favourite vendor why they value your service, and you won’t get answers like ‘because you’re good at arranging viewings’; they will tell you that ‘you always make me feel better whenever you call, even when there’s no news’, or ‘I know you’re always on my side, doing your best for me’. The best clients thank you often, buy you chocolates and write passionately grateful notes in thank you cards. They make you feel needed and valued, because you are. Isn’t that worth getting out of bed for? 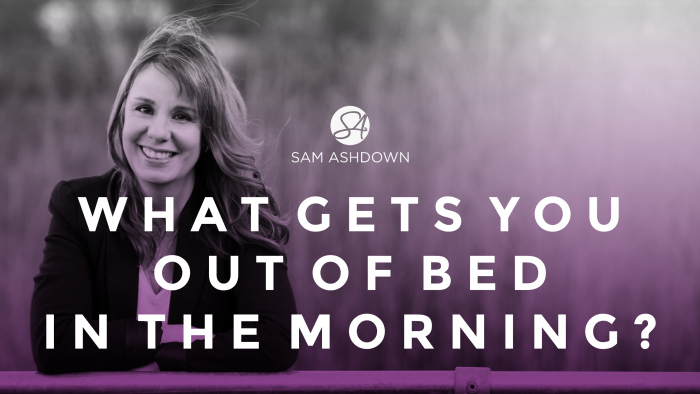 If you’d like to have a chat about this, drop me a line at sam@samashdown.co.uk – I’d love to hear from you. What to read next: When Did Estate Agents Become Marketers? Previous post First, last or middle?